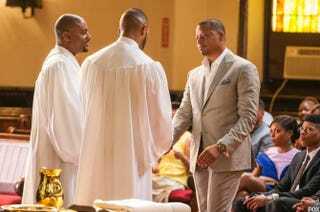 Lucious (Terrence Howard, right) could use a dunk in the baptism waters. It's official: Lucious is off the hook for Bunkie's murder. The feds' case rested on Vernon's testimony, but now they know Vernon is dead. The feds label it suicide; it wouldn't look good if they revealed that the witness's corpse wound up in the prosecutor's passenger seat. Lucious welcomes Andre back into the Empire fold; it's his reward for digging up Vernon's body to exonerate Lucious. Andre is named president of Lucious' revived label, Gutter Life Records. Pop open a 40 and grab the Funyuns—the celebration involves hoochies sliding down poles and writhing on the conference-room table. According to Andre, God has been talking to him; God gives this party the side-eye. Andre seeks counsel from his pastor. Michael becomes a fanboy when he sees Ne-Yo in the studio with Jamal and squeals with delight because Ne-Yo will join them on the tour. Lucious tells his son that significant others don't belong on the tour; they are a distraction. A distraction from what, cheating? Ne-Yo thinks that Jamal should ignore Lucious. Ne-Yo is a wise man. Jamal should also ignore that leering artist who has been hanging around. The artist, who looks like a hobo, comes on to Jamal and drops to his knees when they are in a weird random sci-fi tunnel. It's true—black people are taking over Star Wars! Jamal declines, but Michael sees what's going on and is not having it. As Tiana exits the Lyon Dynasty studio, she's approached by some fans for a selfie. Fans usually don't have blades between their teeth. Tiana doesn't get hurt, but they run off with her bag. A video is posted on YouTube showing the culprits and some other folks dressed up like they just left some sort of sad V for Vendetta cosplay event at Comic Con. The spokesman says, "Welcome to my kingdom, Lyon Dynasty. You wanna chillax here, you gon' pay tax here." I'm sorry, "chillax"? That is the whitest street word ever. The spokesman helpfully adds a few lines in Spanish. ("To hear this threat in English, press 1.") Cookie later meets with producer Laz Delgado. He points out that since the studio is in the shadiest neighborhood Cookie could find, the neighbors assume that she is swimming in cash and will come for it. Andre informs Rhonda that he's getting baptized and must confess his sins. After making sure he doesn't confess that she killed Vernon, Rhonda responds by confessing that she's going commando. Rhonda will not fit in at the church bake sales. In preparation for his baptism, Andre runs around apologizing to his family for all of the season 1 misdeeds that we've forgotten about. Empire loves flashbacks; this would be the time for some. Bottom line: Everybody forgives him. Jamal takes Ne-Yo's advice and goes to reinvite Michael to join the tour but finds him being, uh, serviced by the hobo artist. That's not the most shocking part of the scene. What's shocking is that Jamal's wearing an odd shirt that makes it look like he's got cleavage. Some hooligans burst into Cookie's studio while she is chillaxing with Delgado. They admit they were sent by Thirsty, Lucious’ lawyer. They have surveillance equipment and obviously want to steal her music. Cookie and Delgado chase them off, and Cookie seems turned on that Delgado is "packing." She likes his gun. Andre later tells Lucious that Thirsty's goons broke into Cookie's studio. Lucious says that Thirsty doesn't do anything without his permission. Andre has persuaded the whole family to attend his baptism. As his son is submerged, Lucious remembers nearly being drowned in the bathtub by his mentally ill mother. This whole show seems to be borrowing from the Scarface theme, and there is also a Godfather vibe, so you’d think this would end up in a bloodbath. Nope, it all goes according to plan, so chillax. Meanwhile, out of the blue, Hakeem goes for a run and someone forces a bag on his head and he’s shoved into a van. This is fishy; where is Boo Boo Kitty? Unfortunately, we'll have to wait until the World Series is over before we find out what happened. Let’s go, Mets!